Sodastream At my house, we’ve long waged war on excess packaging, and recycled for Britain. (Well, recycled for the planet, really.) But as a non-drinker of alcohol (on school nights, at least), I do like a glass of sparkling water. The result? Too many glass bottles going for recycling – and a fair few plastic San Pellegrino bottles headed that way, too. (Not entirely confidently since nobody’s 100% convinced that our local council DOES recycle plastic, even though we’re asked to separate it out.) Enter the Sodastream, which has changed our lives – especially since it’s now available with glass carafes that are smart enough to serve to guests, too. We take water that'’s been purified by our reverse osmosis filter, and at the touch of a button zap C02 through it to make THE most delicious sparkling water – so good that we actually call it ‘Sams Pellegrino’ (my married name! ), because it’s as good as my favourite bottled sparkling water. It’s not only saving on waste (the C02 cartridges can be returned for refilling), but saving a small fortune in the cost of buying bottled water. (Although the cartridges cost £22.99, that includes a refundable deposit of £10, deducted from the cost when you next order a cartridge on-line.) A win, win, win. 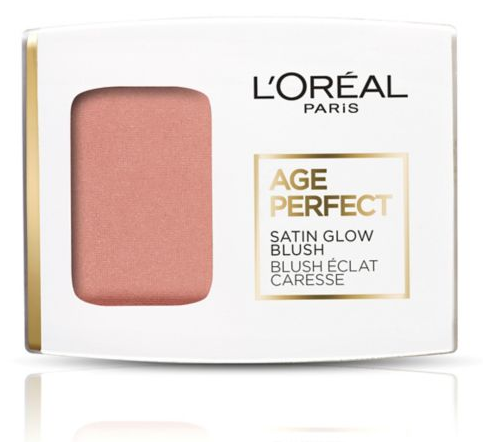 L'Oréal Age Perfect Satin Glow Blush I’ve fallen in love with powder blusher all over again, thanks to this: a wonderful, flattering tawny rose blush which delivers an utterly seamless, complexion-perkifying flush. Cute half-mirror in the lid, too. Maybelline The Eraser Eye Perfect & Cover Concealer Setting valiantly out to walk from Soho to the City into an Arctic blast recently, I had to nip into a Superdrug for make-up supplies after the cold make me weep most of my eye make-up down my cheek. I found this brilliantly affordable concealer, which blends beautifully via the sponge tip, repairing my under-eye zone and banishing shadows with a dab or two. Such a steal!